Delicious and easy to make gingerbread man recipe. 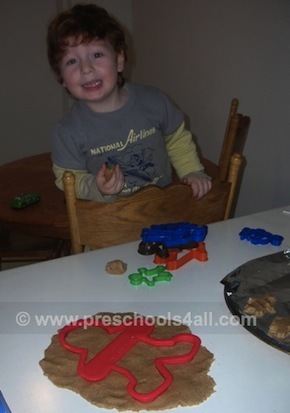 Bake the best gingerbread man cookies with your preschoolers. "I run from a husband, I run from a wife, I run from a butcher with a carving knife." 2 Tablespoons Ginger-or 6 tsp. 2. Add the eggs, molasses and vinegar. Beat well. 3. Sift together all the dry ingredients. 4. Stir into molasses mixture, and mix well. 6. On lightly floured surface, roll out dough to 1/4 inch thickness. 7. Cut with a gingerbread cutter. 8. Place an inch apart on greased cookie sheet. 9. Bake at 350F degrees for about 8 to 10 minutes or until done. 1. Cut out a gingerbread man shape out of paper. With a hole puncher make holes all around the edges and create a lacing activity. 2. Use gingerbread cookie cutters as tracers. Click here to learn more about fine motor activities for preschoolers. 1. After reading a variety of versions of the story, ask the children to tell you their own ending. 2. Create mini books to allow the children to draw their own stories. Click here to learn more about handwriting practice for preschoolers. Dress up clothes of the characters in the story, puppets of the characters. You can also turn your creative center to the kitchen of the little old man and the little old woman by adding play dough, cookie cutters, oven mitts and cooking tray. Tell the story while allowing the children to add the background music. How can we play music that is suspenseful? Uplifting?